It is a rare day of writing indeed when there is not a cup of tea at my elbow and today is no different. Being a traditional sort, I favour a cup and saucer but nothing quite like the unusual item that has caught my eye today. 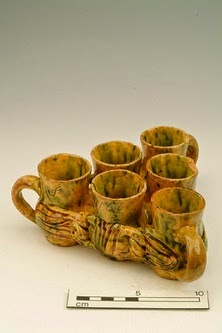 It is a fuddling cup and believe me, when the fuddling cup appears, merriment is never far away! These 1766 fuddling cups at first glance appear to be individual vessels but in fact, the cups are connected one another and are used in the commission of a drinking game. The challenge in using the cups is to drink from each without spilling your refreshment of choice and to be victorious, the canny drinker must use each cup in a specific order. Get the pattern wrong and you can be sure that your shirt will be ruined by ale! How fun! I'd never heard of them before! I imagine they made for a riotous gathering!